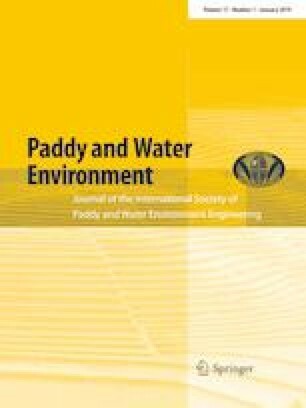 This study examines management problems of WUA C1 of the Kpong Irrigation Scheme (KIS) in Ghana using the 13 evaluation indicators derived from theories of common-pool resources management proposed by Ostrom and Freeman. The evaluation shows that WUA C1 lacks the indicator of water control ability even though C1 has fine irrigation facilities that enable independent water management within WUAs. The reason is that KIS has been managed by Joint System Management (JSM) in which the KIS Office of Ghana Irrigation Development Authority operates and maintains the main canal, main drainage and main road, while WUA C1 operates and maintains the branch canal and below. However, the KIS Office could not fully operate and maintain the irrigation facilities because of budgetary limitations. In irrigation management transfer, it is common to set JSM that allots the management of main canals to the government (or scheme management entity), and the management of lateral canals and below to WUAs. However, from the perspective of WUA organizational evaluation, it is possible that JSM harms the water control ability of WUAs. The author wishes to thank the Japan International Cooperation Agency (JICA), the Ghana Irrigation Development Authority (GIDA), and all concerned in the Kpong Irrigation Scheme (KIS) for their cooperation with the author’s survey and research. Also, the author wishes to thank Dr. David Freeman, Professor Emeritus, Colorado State University, for his valuable comments and suggestions.